Paul Cook had spoken of freshening up a stale side in need of a match-winning jolt. He had decreed Conor Chaplin would be granted a first league start of the season in recognition of his flourishing development. Yet it was to be a system switch and the entrance of Adam Webster which would at last wake them from a Fratton Park slumber. In rolling out Plan B at the interval against Barnet, Pompey’s boss masterminded a climb into third spot in League Two. In truth, the 3-1 scoreline masks deficiencies still existing within a side which nonetheless has produced an encouraging start to the campaign. However, League Two’s only undefeated team continues to march. The swagger may currently elude them but progress has been strong. Following successive home draws against Morecambe and Accrington, yesterday represented an important fixture in the Pompey’s promotion aspirations. Certainly, in the build-up Cook had labelled it as ‘defining’ as he eyed a potential 15 points gathered from the opening seven league matches. His wish was granted, even if referee Darren England took centre stage with a second-half performance which left Bees head coach Martin Allen fuming. Yet for Barnet’s vocal protests and jabbing of fingers, they were culpable for their own downfall as a result to favour the home side unfolded. A half-time scoreline of 1-1 was fair on both sides, yet the unveiling of Plan B after the interval would achieve the decisive breakthrough for the Blues as the visitors were knocked out of their stride. In doing so it demonstrated a flexibility in systems Cook had previously elected not to roll out during the course of the league season. 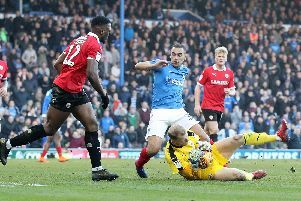 He has stuck faithfully by the 4-2-3-1 which yielded impressive progress with Chesterfield, citing the need for patience when evaluating its outcome. In turn, the formation has contributed to a bright beginning at Pompey, centred on dominating possession, regardless of lining-up at home or away. Yesterday, however, the rolling of an ankle for Gary Roberts prompted a half-time reshuffle and the introduction of three central defenders, with Webster coming off the bench. Chaplin – starting a league fixture for the first time this season – was pushed up to partner Adam McGurk in attack, while Ben Davies and Enda Stevens were instructed to serve as wing-backs. The decision switched the game into the Blues’ favour as suddenly the Barnet side which snapped and snarled its way through the opening 45 minutes lost their bite. Once Jamie Stephens was sent off on 66 minutes, already 2-1 down there was no coming back for an increasingly-irritated Allen prowling the touchline. The keeper had already been served with a yellow card after 30 minutes as he attempted to waste time by delaying goalkicks in front of the Fratton end. When he made contact with Kyle Bennett having ventured out the area as the duo raced for a ball, the set was completed and he was given his marching orders. Only 11 minutes earlier the Bees had found themselves behind for the first time in the match as the ever-tinkered offside rule once again became a topic of debate. Webster’s pass out of defence was meant for Bennett, standing in an offside position and rightly flagged by the linesman situated in front of the South stand. Yet the winger couldn’t reach the pass and instead it ran through to McGurk, who shrugged off the confusion around him to calmly net a right-foot finish. Allen later complained his players had stopped for offside – yet no whistle had been blown by England with Bennett deemed not to have interfered with play. It was merely left for Chaplin to seal the victory six minutes into time added on by latching onto Brian Murphy’s booming goal-kick which had been flicked on. The 18-year-old helped himself to goal number four for the campaign with a composed finish past substitute keeper Kai McKenzie-Lyle in front of the Milton end. Further shine to be applied to the Chaplin’s performance having been granted only his second-ever Pompey league start. The Worthing youngster’s impression on Cook has been immediate, yet has had to bide his time before breaking into the League Two line-up. Yesterday Pompey’s boss elected to drop Gareth Evans in favour of Chaplin, with Adam McGurk replacing Jayden Stockley in attack in two changes to the team which disappointingly draw against Accrington. Stockley’s absence had been forced after his partner gave birth to a baby girl in the early hours of Friday morning. Meanwhile, Ben Tollitt and Kyle Naismith made their first league match-day squads to give the bench an attacking look about it if required. Ultimately, it would be Webster who would have a key role in the result, slotting into a back three as well as assisting McGurk for the second goal. Yet it was his defensive brilliance which caught the eye the most, proving to be an immense presence alongside Christian Burgess and Matt Clarke. Once the Bees were reduced to 10-men, Clarke was withdrawn as Cook reverted to his 4-2-3-1 formation in the knowledge they now had a lead to see out. Yet in the first half it was very much honours even, despite Allen’s side taking the lead after 25 minutes. Mauro Vilhete picked out Andy Yiadom lurking on the left-hand side and he calmly slotted home a first-time shot to break the deadlock. Their advantage would last until the 37th minute after Gary Roberts had been brought down by Yiadom near the left-hand touchline. The midfielder picked himself up to deliver the ball into the box and when it was partially cleared Chaplin popped up to take possession and produce a right-foot finish. It represented the third goal the youngster has netted at the Fratton end this season as he continues to revel in the first-team environment. Then arrived the second half during which Cook’s side clinched only their second home win in four League Two matches. It leaves the Blues in third spot, one point off early pacesetters Leyton Orient ahead of next weekend’s tough trip to Oxford United. And for Cook there is also the knowledge he has an effective Plan B.